This scan was taken at 5 weeks I am now 12 weeks and 3 days. I was diagnosed with momo twins tuesday 12-15-09. I go back in 1 week because they are determined to find a menbrane between my babies I will keep you updated. Hi Jenni, I had an unusual connection to your story and would like to share it with you unless anything pertaining to this subject is too upsetting for you. Jenni ....so sorry for your loss. Hi Jenni, I hope everything went fine with your pregnancy. I just got the news that I'm having twins. They think they may be Moni twins bc no membrane was seen. I was only 6 weeks 4 days, so I am scheduled to see a specialist for a high resolution us in four weeks. I hope they see find the membrane, but looking at your us pics.....mine looks just like that. I'm just a little scare, but leaving everything in God's hands. I had my us an there was 2 sacs I go back in 10 days to find out more an check heart rate I'm so excited. But the funny thing is I have no sickness at all I fill great this will be my 3rd an 4th kids so crazy jumping from 2 to 4. But I'm ready. Do twins discuss life & death? My mom had 2 waters when I was born, but only I was born. No mention of another child. Was there another -- which died before or after term? If so, did we discuss which of us should emerge into the world to perform the destiny / purpose that both were intended to get done/ How will I find ut about this ? I am age 65 male now, i am not gay but emotionally I think like a woman a lot. I am also left-handed and unusually strong bones. -- with blood marrow of course. Everyewhere I go shopping, about five minutes after i arrive with no crowd, all of a sudden 10 more people come along and there is a big group for the place to handle. Is my twin with me still and us attracting attention ? Why can't I get a date for 20 years ? Is it because people see I am already with a woman, my twih, and think she is my girlfriend ? ? I have my 11 wk ultrasound next Wednesday, and I have this gutt feeling that I'm too expecting twins. This is my 3rd pregnancy, but I have NEVER felt so sick before. All day and night, every day! The Zofran that the doctor's office prescribed doesnt even cut it. It's horrible. Quite honestly, I would not be obsesing about it if it weren't that my oldest has always reffered to my stomach as "the BABIES" since day one! Pretty much, I was wondering if any of you have had the same symptoms!? I also feel extremely fatigued. When 1pm hits, and I must put my kids to take a nap so I can too rest. I can't wait for my appt next week!!!! I am scared to death. I had a miscarriage on 4/19/11. Never had a period and found out at the end of May 2011, I was pregnant with a home test. Went to the Dr. and had a vaginal u/s. No one really knows how far I am. There was a gestational sac and one yolk sac. Went back 11 days later there is now 1 gestational sac with 2 yolk sacs but still no fetal pole or HR. The Dr. seems to think I am just really early and maybe at most 6 weeks which is in place with my HCG blood work. Can anyone offer any advise. I am set to go back in another week to see if there are changes. My twins are 14 months old and I feel bittersweetness reading all of your stories. My guys were unexpected, (but oh so welcome!) as I had only one ovary, one tube and was over 40 yrs. of age. Every day, I prayed as I went to the bathroom, "please no blood, please no cramps, God, please no nothing!" I did have some bleeding around 10 wks, nothing serious. Had some cramping til around month 4. Who knows. I envy all of the ultrasounds to "visit" my littles. I loved every minute of every visit. I do not however envy the constant roller coaster ride of "will my babies survive?, will they go to term? will they be healthy?, can I really be that lucky???" Well I was, that lucky, we were. My family is busier than I could have ever imagined. My husband, older daughter and I are absolutely loving every minute of every day with our littles. They have blessed our family like nothing I could ever describe. Enjoy your pregnancies, enjoy your babies. It is truly a miracle. Best to you all! last week i went for my first ultrasound, im 5 weeks pregnant. we saw two sacs. does it mean that im having twins? she did say that it was too early to tell because we didnt see anything but the 2 sacs. i got to go back by the end of this week to know for sure. ive seen ultrasound pictures for 5 weeks and it is definate people have twins but is my case the same? 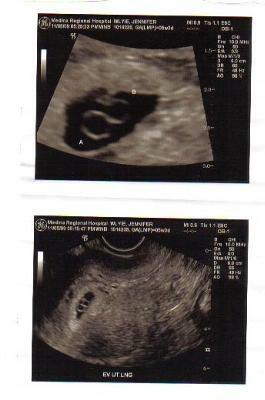 I went in for my first prenatal appointment two days ago, i was 12wks 2days, and found out that we were having twins. I was extremly suprised since we have a 2yr old girl at home. We saw both heartbeats and little jumping bodies that were measuring equally at 12 wks (good sign). The doctor couldn't see a membrane in between the twins and told me to come back in 4 weeks to see if they might be able to see a membrane then. We decided to seek out a new doctor that specializes in high risk pregnancy. I will meet with him at 13wks 5days. I will also be seeking out the opinion of a perinatologist. Im hoping to get more answers soon as to whether we will be having momo twins or regular identical twins. Good luck to everyone in the same situation. when did you first hear your momo twin heartbeat?? i am 9 wks and the couldnt find a heart beat for them..so say it takes longer to hear it.. when did you hear yours?? at my routine 18 week ultra sound on 1-26-10 no heart beats were found, i was enduced 1-26-10, my identical twin gils were born at 7:44am and 7:49am 1-27-10. We named them Jett and Jaxx, my little angels are safe in God's love now. I love you Jett and Jaxx Watters take care of eachother and watch out for that Chuck guy lol just kidding he was waiting for you two, love mommy and daddy. I had five ultrasounds between 8 and 20 weeks - no membrane detected. Found it at 21 weeks! My OB said this was not all that uncommon and that it gets easier to see the membrane as time goes on. I am 11 1/2 weeks pregnant with what they have said are momo twins. I am so happy to know that it is possible to find the membrane still. My next appointment is on Feb. 1st and I am just praying that they will see a membrane. I am happy for you that they found yours! Good luck and God bless. boo it is momo twins but I am super excited, so is my 9 year old son.